Having a free hand or two. The benefits of babywearing still apply on vacation. Your baby may sleep easier in a carrier. Not all attractions are stroller accessible. Not all cities are stroller friendly. You will want it for the airplane, trust me! See our full post on Travel with a Baby Carrier vs Stroller here. We always chose to use a baby carrier at the airport (often without even bringing a stroller on our trip with us and choosing to rent baby equipment at our destination instead). It doesn’t happen all the time, but often you’ll get right through security without even taking your baby out of the carrier. And if your baby isn’t sleeping, it’s not really a big deal to take them out if you have to. Going through security with free hands is invaluable. Plus you won’t have to completely empty a stroller to put it through the x-ray. Every parents dream is that their baby will sleep through the flight. You’ll save your arms (and maybe even be able to hold up a book or feed yourself) if your baby falls asleep on you in the carrier. If your baby is having trouble sleeping or it’s just not nap time, having a carrier to walk you baby around or even just to not have to hold your baby the entire time will be a lifesaver. Your arms will thank me! Don’t miss our post on how to entertain a baby on a plane! We have regretted taking our stroller on public transit nearly every time we tried. Either we had to fold it up, or there wasn’t enough room or we couldn’t get it through the turnstiles. A baby carrier is so much better for these trips. There are plenty of places around the world where you either can not or will not want to use a stroller. 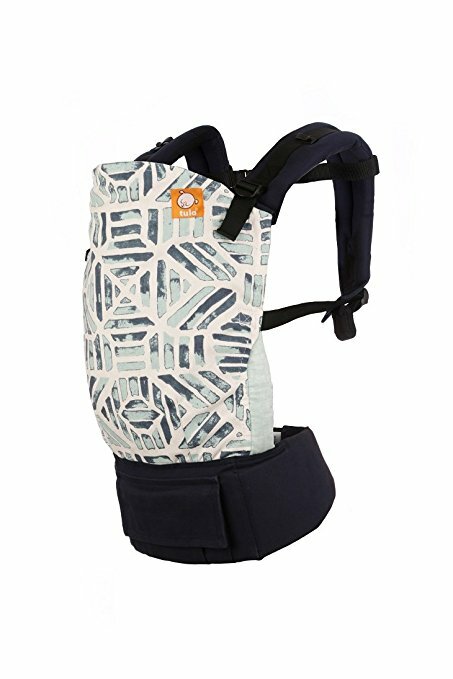 Having a baby carrier will mean you won’t have to miss out! Wraps are excellent for infants and very small babies (typically from birth until about 20 lbs). They don’t require any type of infant insert. If you get a true wrap (as opposed to a carrier like the Baby k’Tan) then it’s a one size fits all. They are a soft without any buckles, like wrapping your baby in a blanket. Structured carriers can also be used from birth, but many of them require an infant insert. A structured carrier will have a much higher weight limit and some are even toddler specific. 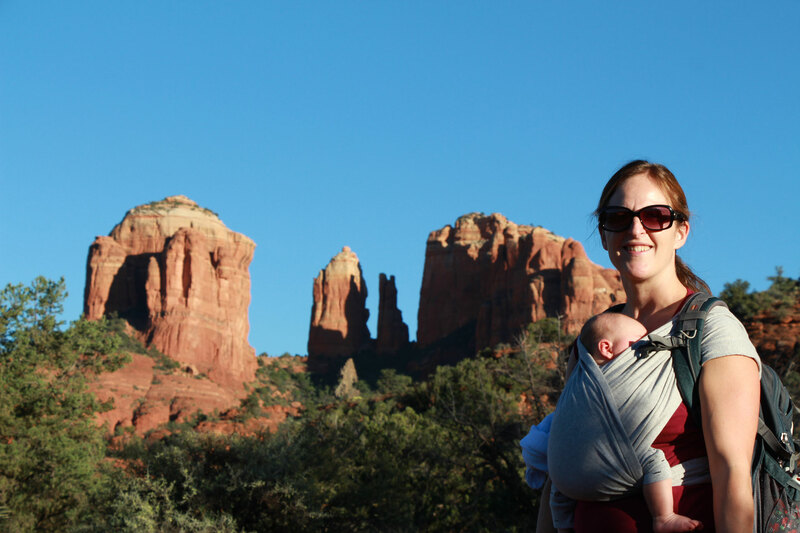 You probably can do a back carry in a woven wrap, but it’s much easier to do in a structured carrier. A carrier likely will have a few pockets to carry keys, etc. Depending on who will be doing the baby carrying, Dads typically (obviously, not always) prefer the carriers over wraps. A ring sling will be easier to put on than a wrap, as the techniques to wrap must be mastered before it’s easy to take your baby in and out. Your baby will outgrow the wrap quicker. A ring sling can still be used with a toddler. Ring slings are smaller than a wrap so can easily be put into a bag or pocket, additionally they are easier to change your baby’s position. 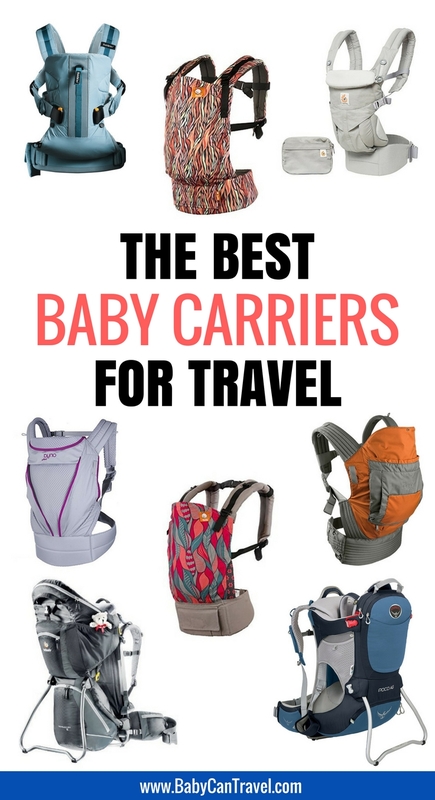 So now that I’ve hopefully convinced you that a baby carrier is a must for travel, which one should you get? The options can be overwhelming. Our first recommendation would be to do your research (which we’ve done for you below) then try them out before you buy. How can you do this? See if you can borrow from a friend, visit a babywearing lending library or join a babywearing group. When it comes to choosing your baby or toddler carrier, these are the questions you need to ask yourself: How long do you hope to use it for? Will you want one without an infant insert? How many carrying positions would you like to have? Do you have any back, neck or shoulder issues? How important is the fabric and/or the option to have fun patterns? Do you plan to use it mostly in warm destinations? 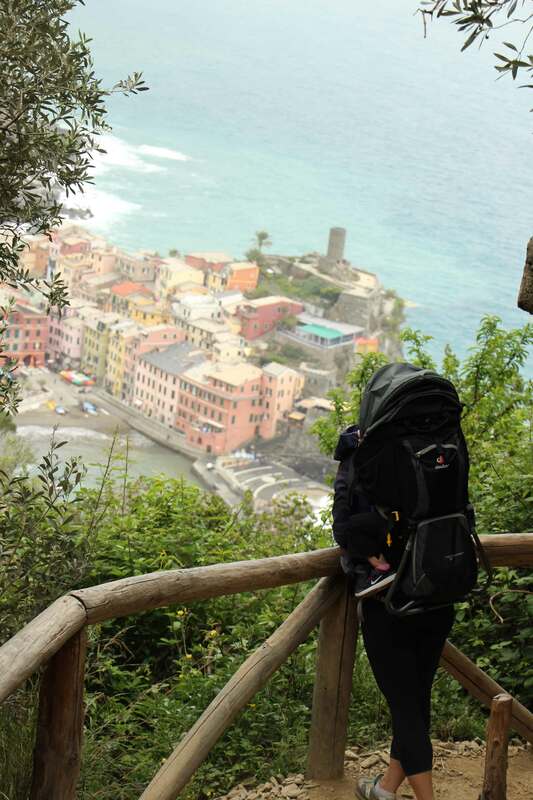 What types of activities will you use for most: sightseeing or hiking? And finally, what is your budget? Why wouldn’t you want to use an infant insert? From my own personal experience, I much preferred using our ergo when we didn’t need an infant insert anymore. It can be a lot hotter for your baby and it’s just one more item we had to pack (and they do take up more room than you would want to spare). It was great for colder temperatures though so this may be dependent on where you are going or where you live. Coast Mesh line has a breathable mesh panel. - Body panel has three width settings and 2 height settings. - A lot of fun patterns. - Strap buckles all the shoulder straps to be worn criss-cross in the back. 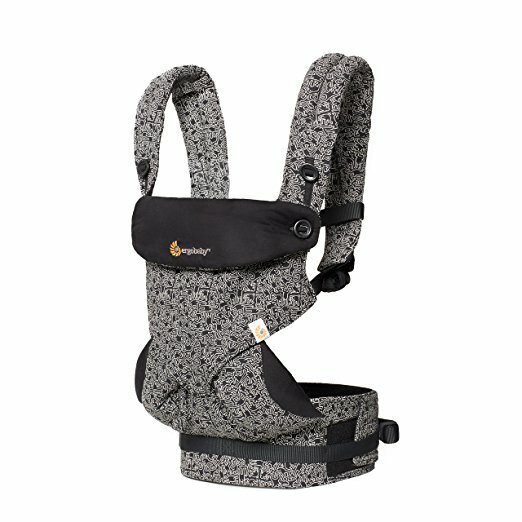 - Detachable pouch that can be worn in various places on the carrier. - Can wear backpack style or with straps criss-crossed in the back. Fabric: Made from breathable & lightweight twill. Variable width and height settings. Body panel has three width settings and 2 height settings. A lot of fun designs to choose from. Options: Coast Mesh line has a breathable mesh panel. Strap buckles all the shoulder straps to be worn criss-cross in the back. Detachable pouch that can be worn in various places on the carrier. Can wear backpack style or with straps criss-crossed in the back. Options: Airflow line features 3D breathable moisture-wicking mesh. All Seasons line features an adjustable center panel: zip up for warmth and zip down to for breathable mesh. Wondering which baby carriers will work best for plus size parents? Many of the ones we’ve listed here are also the best baby carriers for plus size parents. Has a sturdy, flexible head support that to support your newborns neck but no privacy hood. Options: Air line is made of mesh and Outdoors line is made of water-repellent & moisture wicking materials. Why would you get one of these instead of getting one of the baby carriers that don’t require an infant insert? Perhaps your baby is on the large size and you don’t need to use the infant insert for that long or you won’t be using the carrier right away. 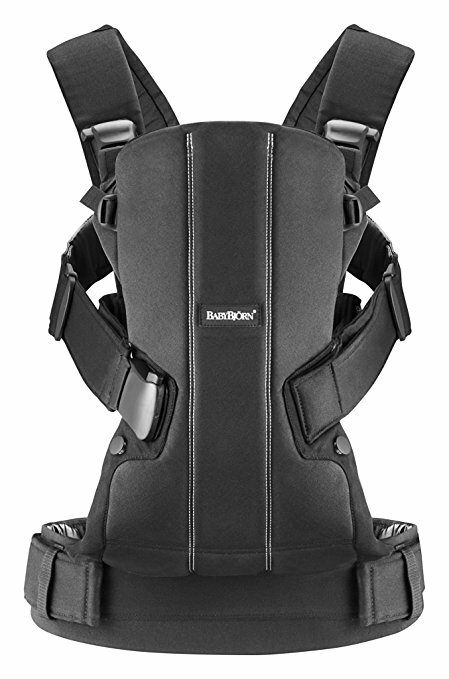 Or maybe you are looking for one that has an integrated seat, like the Onya Baby carriers. You can save yourself some money by going for one of these options, instead of paying for one that has all the extra features. So many fun designs to choose from. All Seasons line has a temperature control panel made of mesh. Options: All Seasons line has a temperature control panel made of mesh. Unzip the cotton flap that covers the mesh panel. 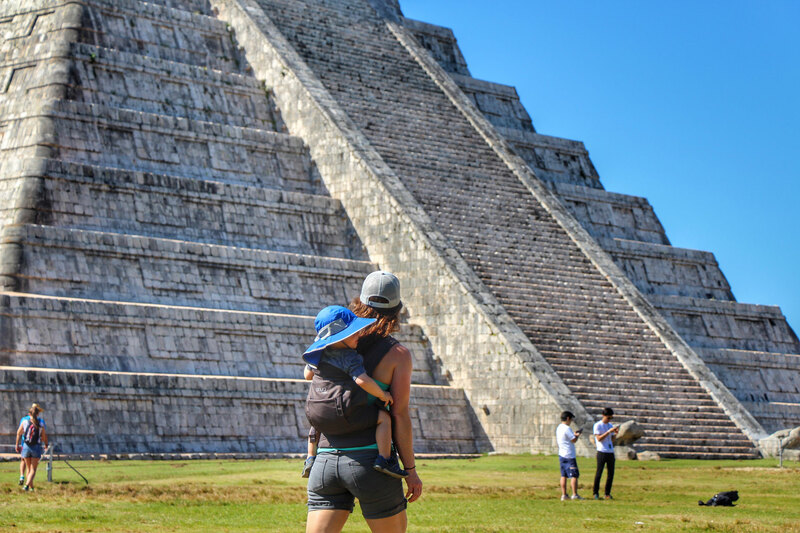 You can read all about our adventures using the Onya Baby NexStep while visiting the Coba Ruins in Mexico with a toddler. Why would I want a toddler carrier when I can just continue to carry my toddler in the regular baby carrier? The toddler carriers are made specifically for toddlers. They are wider and taller making it more comfortable for your toddler. When your toddler is well supported, it’s also much more comfortable for you. I can speak from experience when I say, if you still carry your toddler frequently you won’t regret getting an appropriate carrier! What I love most is that I can bring it along, just in case my toddler gets tired. I throw him up on my back and we are on our way. I also like either of these two options below because they can be used the longest with a weight range that goes to 60+ lbs. - Wider and padded support for baby's legs. - Tall torso that reaches higher up. Options: All Seasons line – Temperature-control panel that easily zips-up for warmth and zips-down to expose cool, breathable, 3D mesh. Wraps have this feeling of keeping your baby close with a blanket wrapped around them. 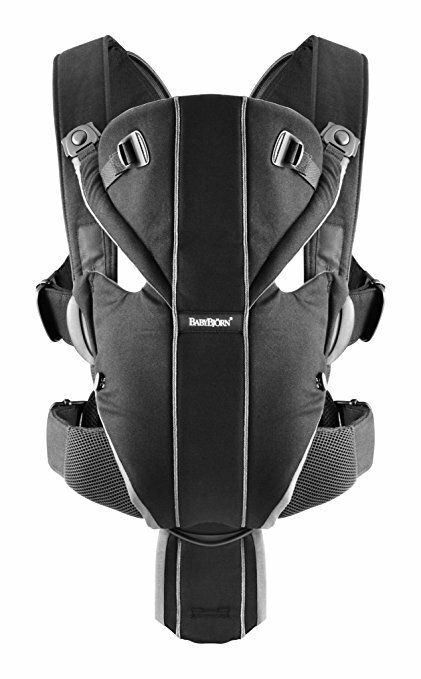 I personally preferred this over a soft-structured carrier with an infant insert when mine were very small. I was intimidated by needing to learn the techniques of the wrap, so I went with the Baby K’Tan which had a similar end result, but was much easier to put on and get baby in. 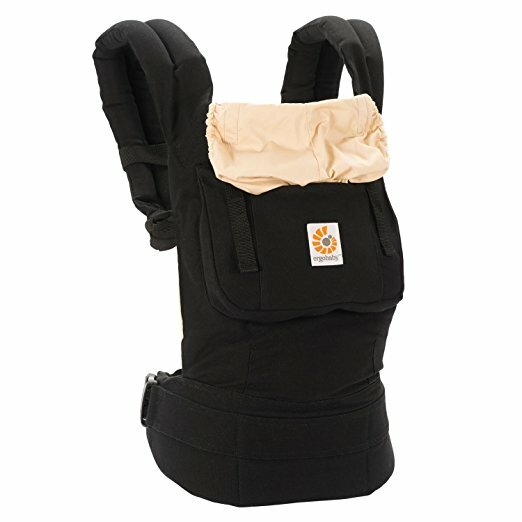 I could also carry my baby facing out which was a nice benefit, although I didn’t use it that much as I found it hard on my back. 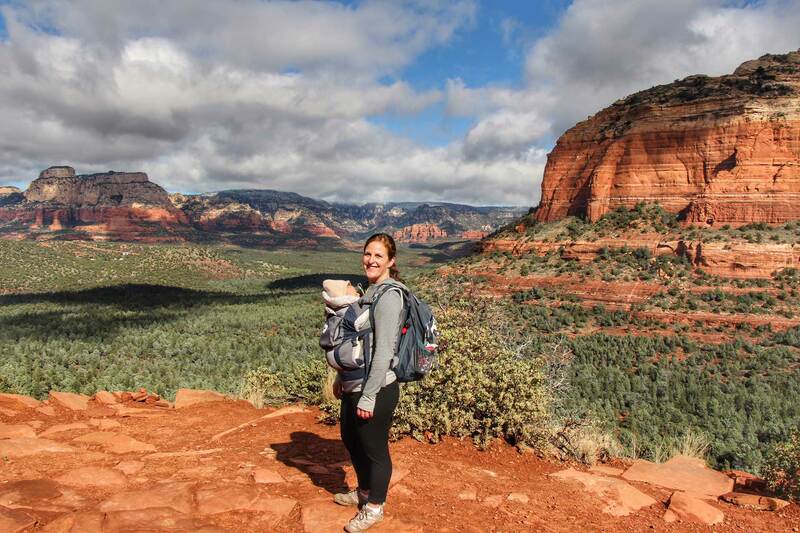 The TwinGo carrier comes as a personal recommendation from our friends at The Wandering Chaos who are no strangers to travel with toddlers (including twins). Can carry two kids of different ages. Can split the carrier so each parent can carry a child. 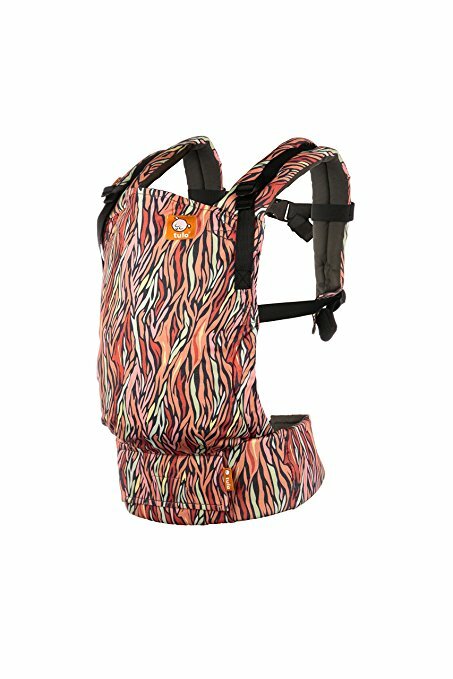 You aren’t going to find a lot of options for baby carriers made for the water, but this is a great product if you frequent the beach. 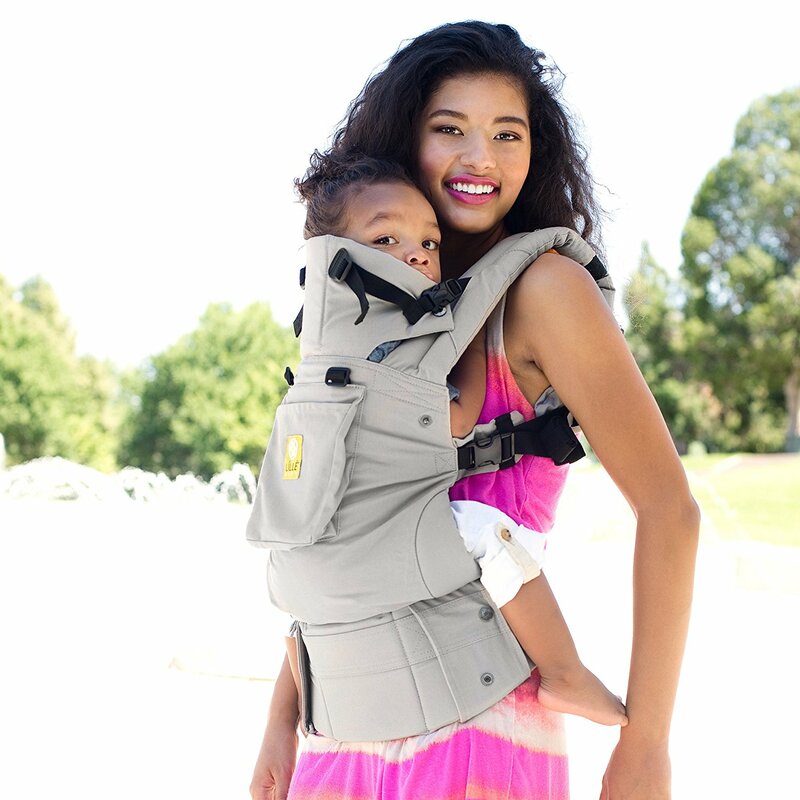 This carrier will allow you to keep your baby close while also playing in the water with your older child. 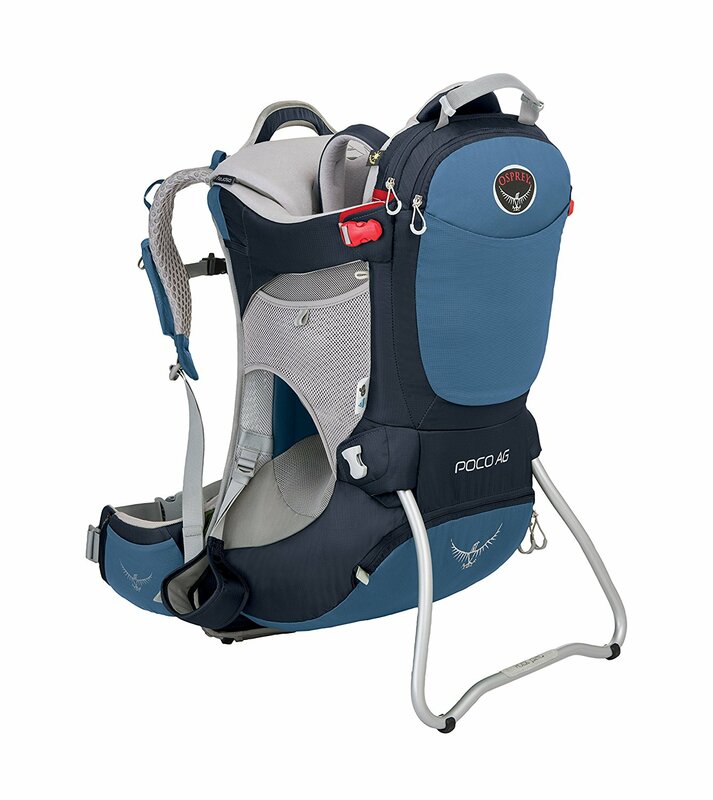 The two most popular hiking backpack carriers are the Osprey Poco & Deuter Kid Comfort 3. Important features to look for in a backpack carrier are how adjustable they are, the carrying capacity, how much room you have for snacks, gear, etc, is there a hydration pocket and how much does it weigh. After you find ones that meet your criteria for all the above, you should try them on. Like every carrier, it will fit everyone differently. 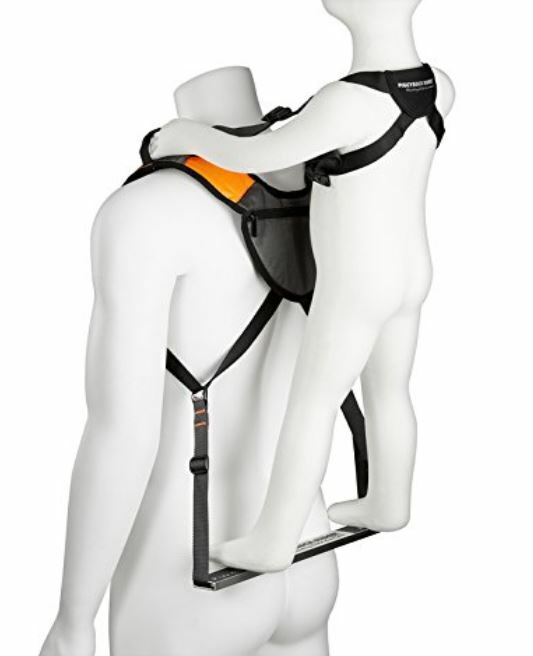 We’ve included the Piggyback rider as a lightweight option, in case you don’t need something as big as a backpack carrier when traveling with a toddler. We like this carrier so much, we own one for each kid. 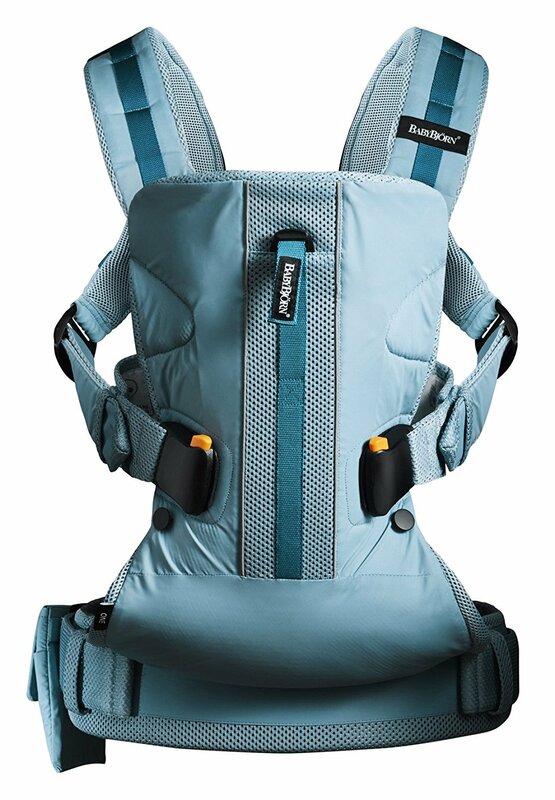 Read more about why we love the Deuter Kid Comfort III for travel with a toddler here. Begin use at 2 years old and up to 50 lbs (max age should be 6 years old). 6-point safety contact with 2 secure hand holds and sturdy non-slip aluminum bar. Packs small to the size of a rolled bath towel. 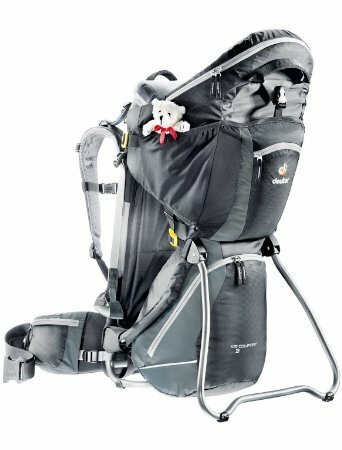 We have used a Baby K’Tan, Ergo Original, Ergo Performance Original with & without infant insert, Onya Baby Nexstep, LILLEBaby CarryOn Toddler Carrier, Deuter Kid Comfort III, and the Piggyback Rider. We also rented a Kelty backpack carrier, but it wasn’t clear what model it was (or we forgot to check). We’ve used our carriers for around the house, hiking, city sightseeing and everything in between. I do the majority of the babywearing, but my husband does it quite frequently too. I loved our Baby K’Tan when each of our kids was itty bitty and would buy it again. I didn’t use it for very long though (maybe 9 months). Baby K’Tan used in Sedona. 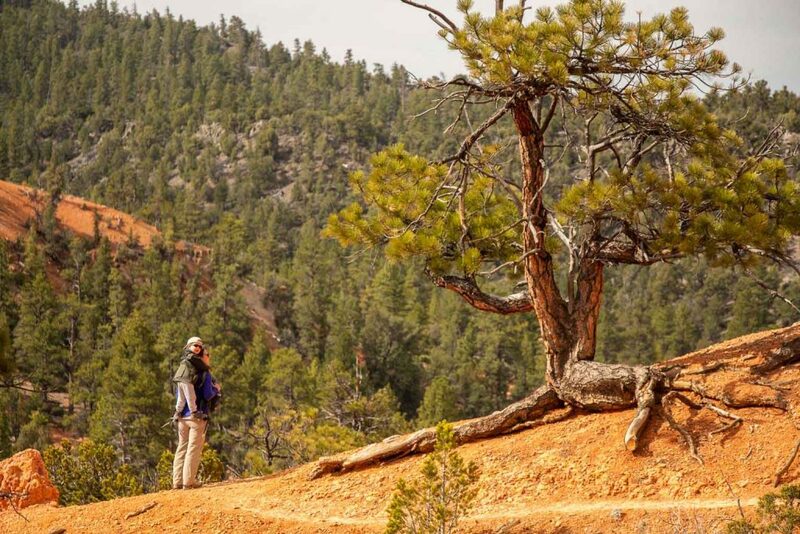 Click for our favourite family-friendly hikes. 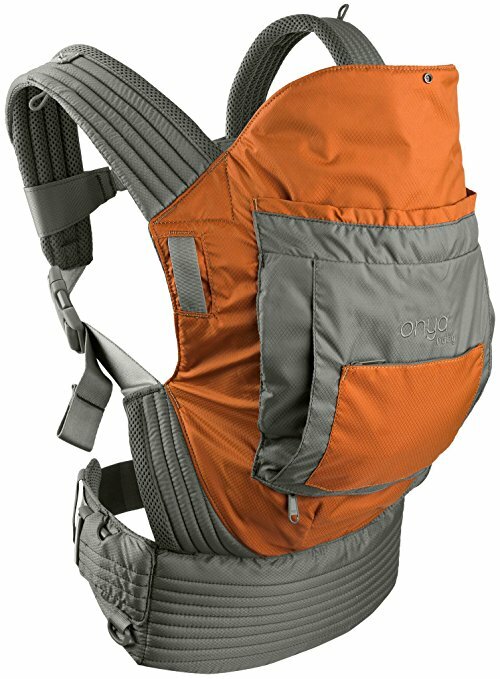 Ergo baby carrier with infant insert used in Sedona. 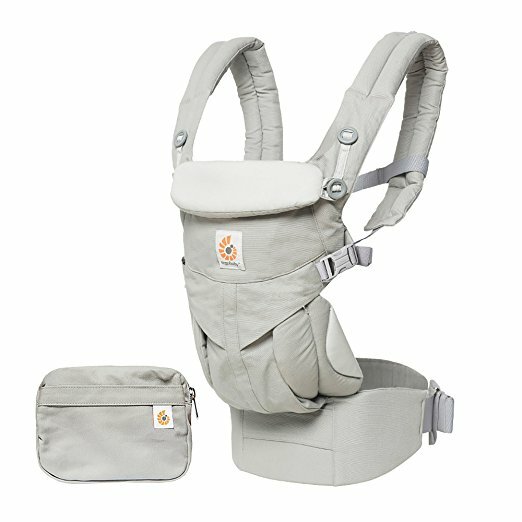 I am frugal by nature and also don’t like to have to carry extra pieces, plus I didn’t really love using the infant insert with our Ergo (especially when it was hot out), so if I was buying a carrier now I would probably go for one that could be used the longest with the most options. My choice would be the Ergo Omni 360 or the LÍLLÉbaby COMPLETE. They don’t require an infant insert, they have the most carrying options and I’m familiar enough with their other products, that I know the quality would be great. If carrying is still an option once your toddler is 2.5-3 yrs old, I would highly recommend a toddler carrier, like the LÍLLÉbaby Carryon Toddler Carrier. 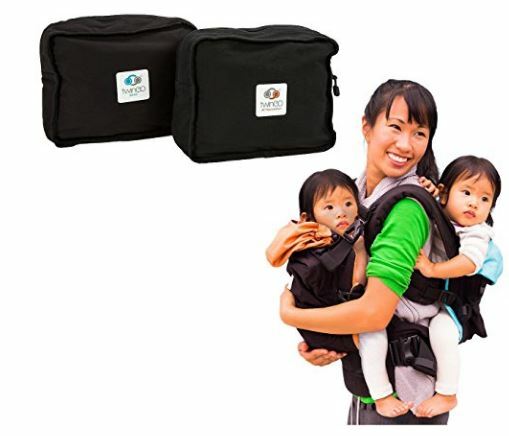 Though the baby carriers are rated to 45 lbs, the toddler carrier is wider and taller, making it so much more comfortable for both toddler and parent. 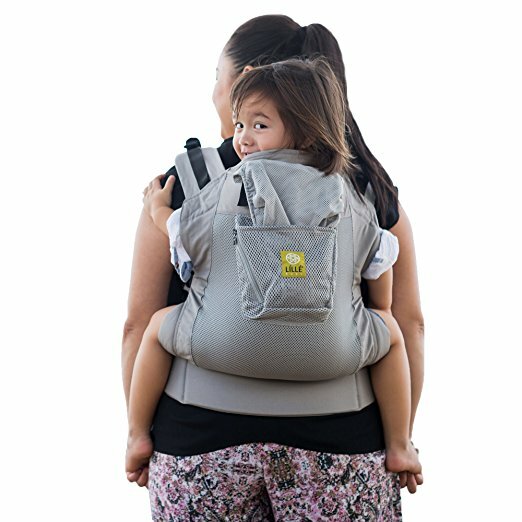 I’ve carried my 4 year old in my Ergo and was surprised how much more comfortable the LÍLLÉbaby Carryon Toddler Carrier was. 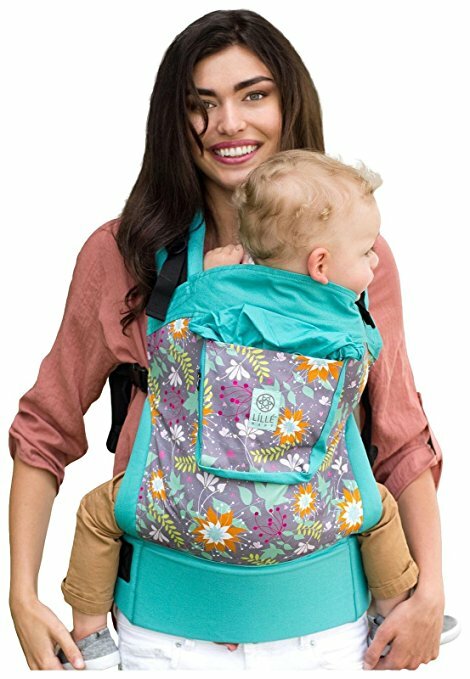 I love being able to carry it around my waist or in my backpack and throw my toddler in it easily on-the-go. When he chooses to walk, I’m not still pushing around a stroller. I’m free to chase him! LILLEBaby Carryon Toddler used in Norway. 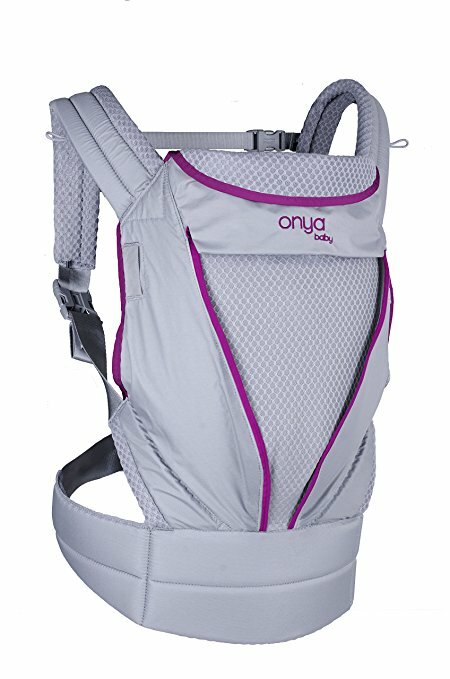 If you are active and travel to warm destinations, then the Onya Baby Outback is worth considering. 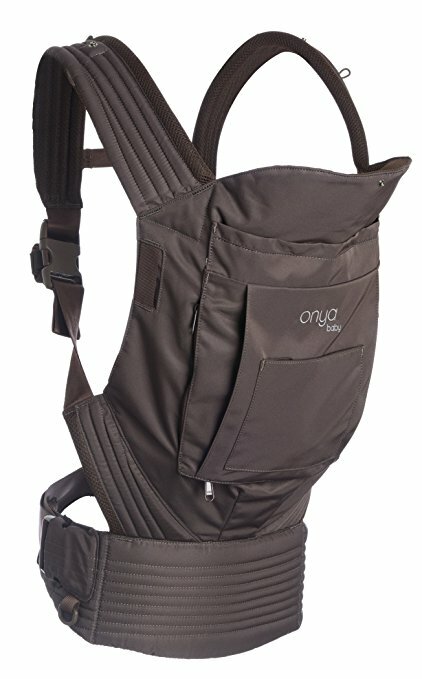 I also really like that the Onya Baby carriers (except the Pure) come with a built in “high chair” so that I wouldn’t have had to carry along my MyLittleSeat fabric high chair. 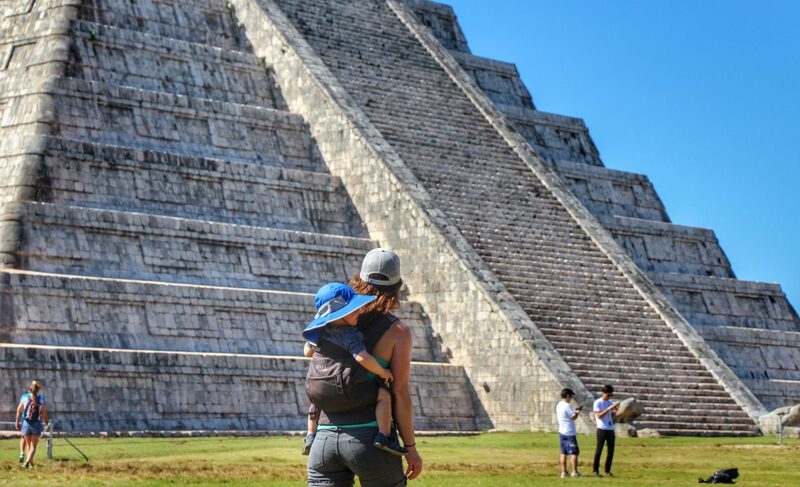 Onya Baby NexStep visiting Mayan ruins in Mexico. Click to read about our adventures at the Coba ruins. 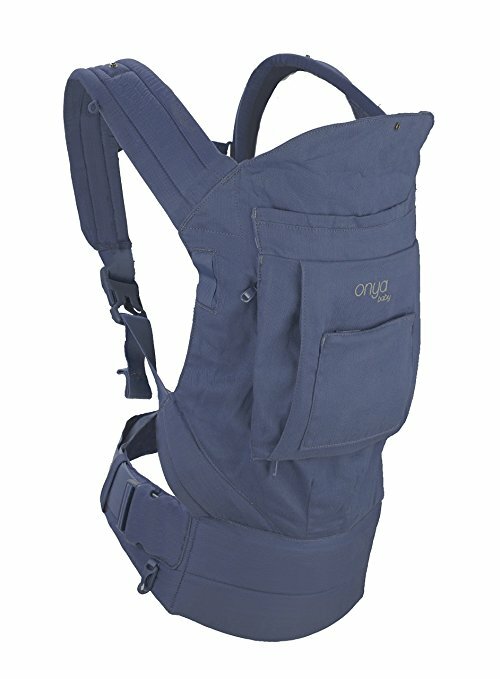 Finally, if you plan to spend a lot of time hiking, look into a backpack carrier. Both of my kids were happier for so much longer in the backpack carrier. They sat up higher, could see more and were cooler. See our full review of the Deuter Kid Comfort III here. Hiking with the Deuter Kid Comfort 3. 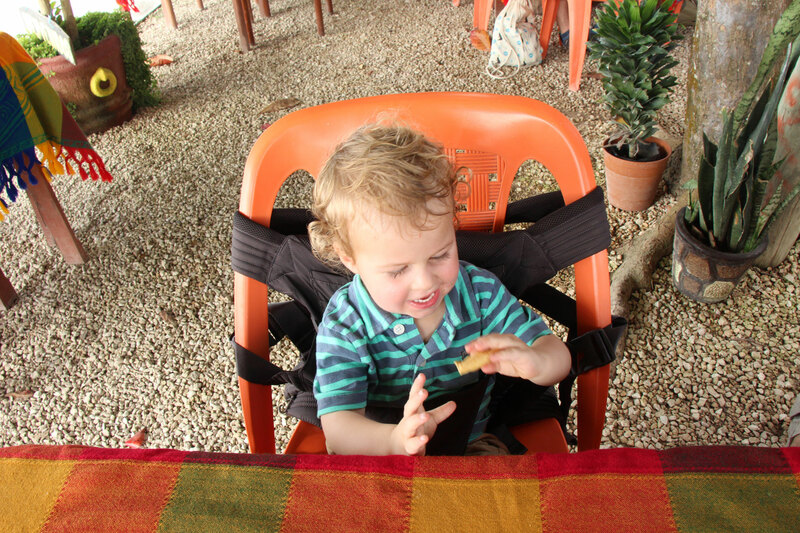 Click to read all about taking a baby or toddler to Cinque Terre. 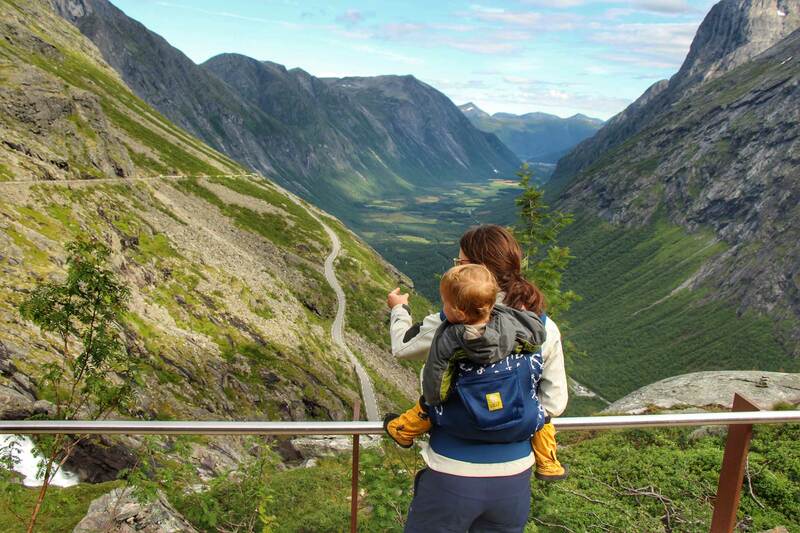 If traveling with a backpack carrier is out of the question or you don’t plan to carry your toddler for extended periods, the Piggyback Rider is a great option. 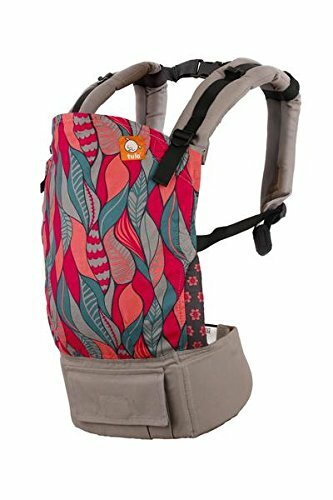 This standing carrier for toddlers packs up small, so you don’t have to worry about how much space it will take and it’s easy to carry around for the day. It’s great for toddlers or preschoolers who want to do the majority of the walking but still need to be picked up every once in a while. Have we missed one? Do you have any questions about this post? Let us know in the comments below! Need baby gear for your trip? We recommend our favorites in our Shop. I love to read this type of material Good and attractive information for all kids & mom.Thank you for posting such a good article. Great Job here! I admire this article for the well-researched content and excellent wording. I got so involved in this material that I couldn’t stop reading. I am impressed with your work and skill. Thank you so much. I really enjoyed this article, and amazing pictures! 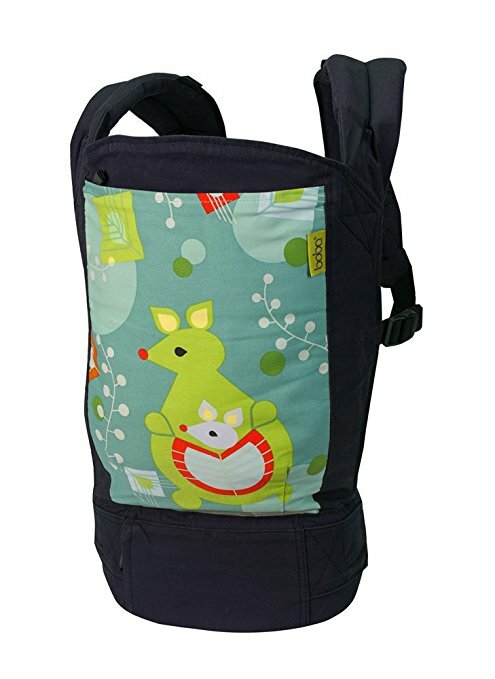 I am trying to find the perfect child carrier backpack for my little one and was wondering if anyone else bought something similar.